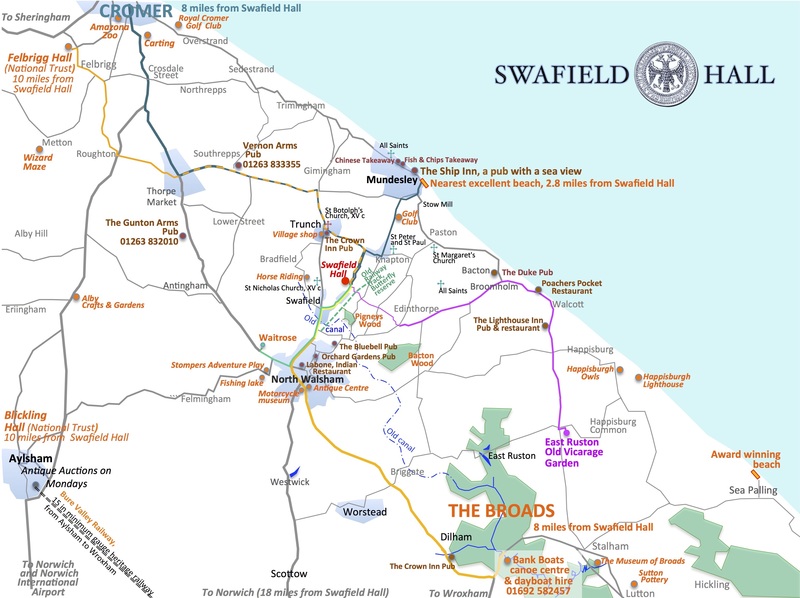 Swafield Hall is ideally located between two main tourist attractions in North Norfolk: Cromer and the Broads (8 miles each side). The estate is very close to the coastal resort of Mundesley, with its wonderful large and flat sandy beach (2.8 miles). Mundesley looks as if it’s been preserved in time, which gives it a unique traditional charm. On the Norfolk Broads, the UK’s largest and finest wetland landscape (8 miles), you can enjoy many activities including renting a boat, sailing, canoeing, kayaking, windsurfing, walking, fishing and cycling. Swafield Hall is rurally located and surrounded by tranquil gardens and beautiful fields. In addition to Mundesley nearby you can find some of the finest beaches the UK has to offer (Cromer 8 miles, Sheringham 13 miles, Sea Palling 14 miles). The National Trust gardens and estates of Felbrigg Hall and Blickling Hall are both situated just 10 miles from Swafield Hall. The exuberant and innovative 32-acre East Ruston Old Vicarage Gardens – 7 miles. If you are going to Norfolk and want to experience the natural world, you just have to see the seals. The colony at Blakeney Point (23 miles) is made up of Common and Grey seals and in recent winters has been the biggest colony in England, with around 2500 pups. But just 5 minutes walk from Swafield Hall you can explore The Knapton Cutting Nature and Butterfly Reserve. It is situated along the picturesque old railway track of the northern section of the Norfolk and Suffolk Joint Railway, which is now a public walkway (a part of the Paston Way footpath). The railway was constructed in the 19th and 20th centuries, though unfortunately the section that linked Swafield to North Walsham was closed in 1964. The Butterfly reserve is full of of wild flowers, scrub and undisturbed grassy banks, which make it an ideal habitat for butterflies. Nineteen different species have been recorded. You can find there a diversity of flowering species such as black knapweed, yarrow, sheep’s sorrel, primrose, oxeye daisy and particularly of note hoary cinquefoil and the small-flowered catchfly, which is classified as endangered in the United Kingdom. 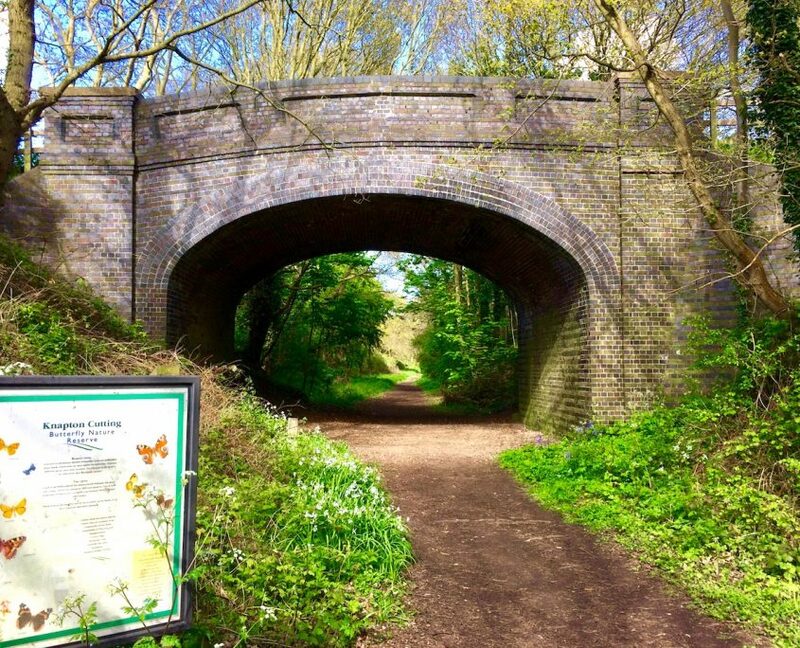 Further along, the main body of the railway cutting is dominated by young oak woodland and the old railway bed supports primroses, wood avens, herb Robert and lords-and-ladies. Paston Way public footpath passes nearby Swafield Hall on the old railway track. 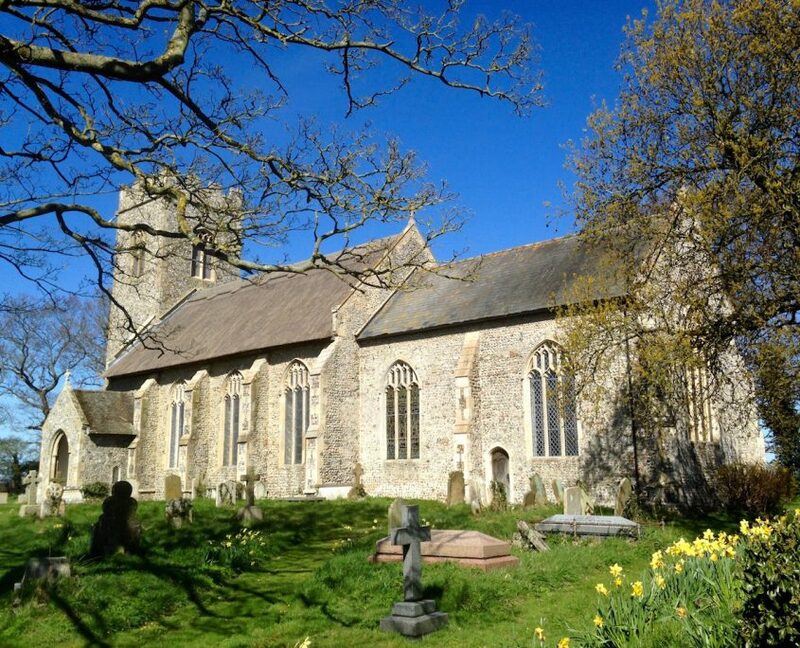 The 20 mile Paston Way goes through the Poppyland of north east Norfolk, taking in medieval churches, pretty villages, rolling farmland and beach walks. 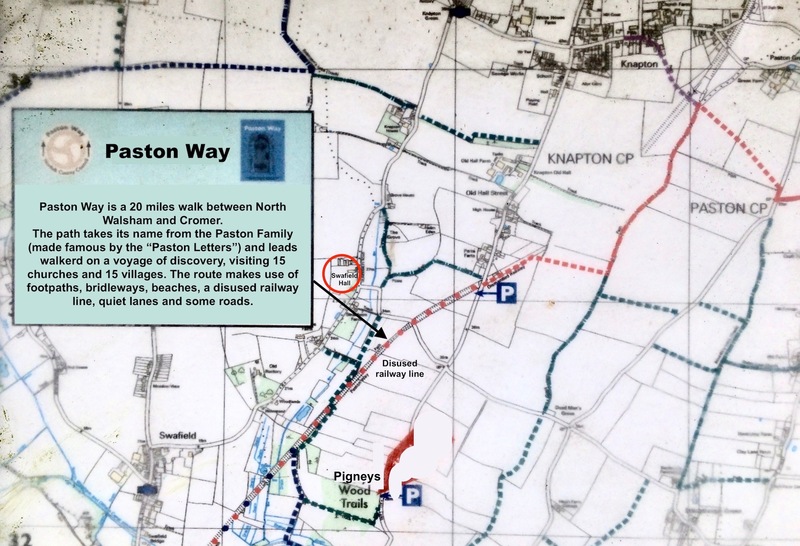 The path takes its name from the Paston Family (made famous by the “Paston Letters”) and leads walkers on a voyage of discovery, visiting 15 churches and 15 villages. The route makes use of footpaths, bridleways, beaches, a disused railway line, quiet lanes and some roads. Pigney’s Wood is 15 minutes walk away along the old railway track, it is managed by North Norfolk Community Woodland Trust and serves as a haven for wild flowers, butterflies and birds. The site comprises 1.7 hectares of mature mixed woodland, 7.8 hectares of new woodland, 8.5 hectares of open ground and 5.5 hectares of low-lying, wet grassland. Over 20,000 trees of forty species have been planted since the site was purchased in 1992. In Swafield village the walkway along the old railway track crosses the course of the beautiful old canal. 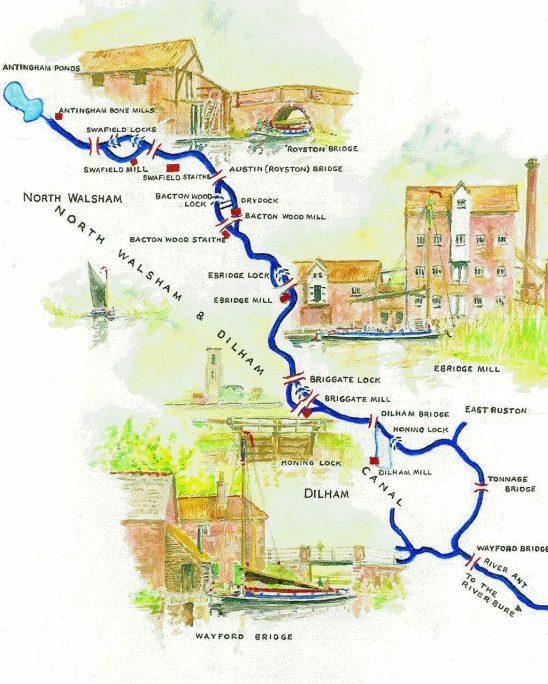 The North Walsham & Dilham Canal is opens to the public for walks and exploring wild life. Swafield is one of only a few villages in Norfolk with a canal – The North Walsham and Dilham Canal, which is the only canal in Norfolk. 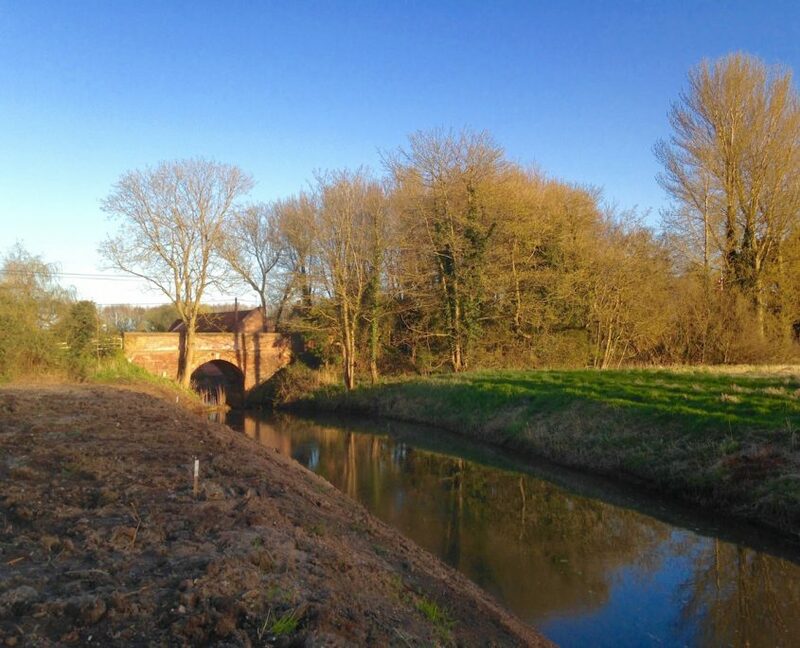 The canal was constructed and opened in 1826 and is 8.7 miles long and runs from Swafield Bridge to a junction with the River Ant at Smallburgh. The canal was constructed with locks a little wider than most canals in the UK to accommodate the use of the Norfolk wherries, hence the image of a wherry on Swafield’s village sign. North Walsham and Dilham Canal at Swafield bridge. Swafield Hall estate is surrounded by beautiful fields, from the west windows you can see a stunning view to the 15th-century church of St Nicholas at Swafield (0.8 mile), from the north windows – a view to the 14th-century church of St Botolph in Trunch (1.2 miles). Swafield village had an entry in the Domesday Book of 1085. It was assigned only a small value and it is not until the 13th or 14th centuries that the church of St Nicholas at Swafield is built. However rebuilding of the nave and chancel in the 15th century attests to visible wealth during this period. St Nicholas sits proudly on a hill and there is a beautiful view to the surrounding countryside. It has one of the few remaining Medieval Rood Screens in Norfolk. The nearest villages to the estate are Swafield (1 mile), with the award winning local butcher Tavern Tasty Meats and Trunch (1.7 miles) with a popular pub ‘The Crown Inn‘ and famous classical concerts during the summer season at St Botolph’s Church. The most interesting part of St Botolph in Trunch is its magnificent wooden carved font canopy, one of only four such surviving canopies in all of England. The nearby market town of North Walsham (2.5 miles) contains several good restaurants, pubs, the local Waitrose, Sainsburys and Lidls. It also has a modern leisure centre (with swimming pool). In North Walsham you can explore the historic market place and market cross, investigate the large town church, take a swim in the local leisure centre or even visit Davenport’s Magic Kingdom, a wonderful emporium of magic and illusion! Have a relaxing time wandering around, or rest on one of the benches and discover the local birds and wildlife.